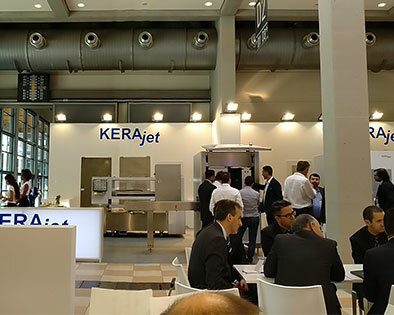 Once again KERAjet has been present in Tecnargilla 2018, one of the most important fair in the world related to ceramics tiles and bricks. In this exhibition you can find latest news regarding manufacture of ceramics tiles, sanitary ware and dinnerware. At that time, it was a pleasure for kerajet to lunch it is latest novelty called “Kerajet M7”. 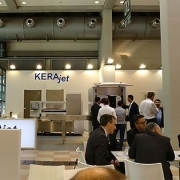 Kerajet M7 is able to get new ceramic lines customized by the end customer, following two basic principles modularity and flexibility. The main goal is achieve ceramics products “100% digital”. Apart from that, our customer have seen the great advantage in digital printing into dinnerware sector Kerajet started dinnerware project one year ago, nowadays Kerajet has installed more than 25 machines in seven different countries. Kerajet is strongly positioned in this marked.